On the hunt for a cheap washing machine? Whether you’re just starting out in a new home or kitting out a new kitchen, buying appliances can seem costly. Fortunately for you, we've got all of the advice on buying appliances on a budget, and there are some great value cheap washing machines under £300 out there that won’t break the bank. What is the best cheap washing machine under £300? When it comes to choosing the best cheap washing machine under £300, the Indesit IWME127UK Ecotime Integrated Washing Machine comes top of our list. Considering it's affordable price point, this model offers an incredible selection of up to 16 programmes that range from specialist cycles for wool, silk and curtains, to easy iron options and heavy duty sports programmes perfect for tackling tough stains. 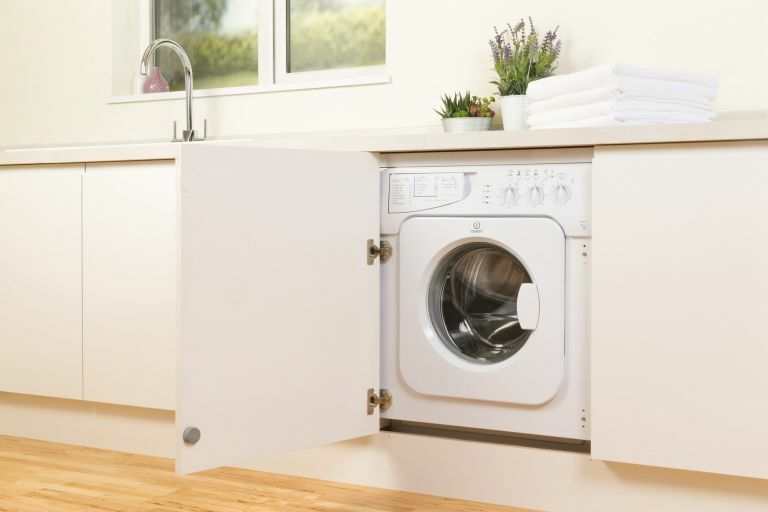 While you can't expect all the options offered by top of the range models, when buying a cheap washing machine under £300, there are some things you should still be looking out for to ensure you're picking the right washer for your needs. Most of washing machines under £300 will be pretty basic, but they’ll still give you a good choice of wash programmes. You can also expect some added extras such as timer delay, specialist cycles for things like sportswear or anti-allergy options, and even some decent drum sizes and spin speeds. Some brands have upped their game by bringing the price of smart technology down so you can find high-tech appliances from the likes of Hoover at a really affordable price. The best thing about this cheap washing machine is that it gives the choice of 16 programmes from specialist cycles for wool, silk, curtains and shoes as well as easy-iron options. Great news for busy families and professionals on the go, there’s also a heavy-duty sports programme that tackles tough stains, so you don’t have to spend time doing a pre-wash or buying special detergents to deal with it. That’s the thing many users appreciate with this model, the fact that it saves time in many ways, including the handy delay timer that enables you to pick a start and finish time to fit in with your lifestyle. Shop more washing machines at Debenhams Plus. A tried and trusted brand, this Zanussi model comes out on top for energy efficiency, meaning you’ll not only be helping the environment, but your energy bills will be lower in the long run. There’s ample space for a big wash in the 8kg drum, while a choice of 14 programmes is enough to satisfy most households. Users love the quick wash option which reduces the duration of your wash cycle by half, and the time delay is handy for even lower energy costs. Added features include digital display, delicate wash, flood protection and half load; which are all great assets for the budget price. Our only fault? The cotton wash programme is the only one which can be spun on 1400rpm, all others are at 900. If you can live with that, or don't mind waiting for the wash cycle to finish and then putting it on a spin cycle, it's a good buy for a cheap washing machine. Browse more washing machines at eBay. One of the best things about this cheap washing machine buy from Hotpoint is its slimmer depth, meaning that if you want to hide it away, you can easily fit a cabinet door across the front. It may be pretty basic with a smallish drum capacity and lower spin speed than most, but it does have everything you need. From a delay timer to a digital display, and even an anti-allergy programme that uses a combination of high temperature technology and extra rinses to neutralise and remove 99.9 per cent of major allergens. The perfect fit for small families or those who don't have mountains of washing, as its quick wash cycle does take 1 hour. However, if you can look past that, added benefits include an anti-stain option, baby cycle, delicates, bed and bath programmes and Woolmark Platinum Care. Shop more washing machines at Appliances Direct. Surprising for the price tag, this model is packed with high-tech features. It has an energy-saving mode that uses sensors to weigh the laundry then adjust the cycle time, amount of water and electricity consumption to suit the load. It also has a One Touch NFC (near-field communication) feature that lets you check on it from a smartphone. Get the Hoover Wizard app and you can download new wash cycles and keep an eye on your washing’s progress while you’re away from home. Similar to most machines, it can be noisy when spinning. If you can look past that, then added bonuses include an extra-large door, great when you’re dealing with bulky items, as well as being able to wash a full load in under an hour. A great cheap washing machine if you're asking us. Shop more washing machines at Currys PC World. Smaller households and those who prefer a designer look will do well with this cheap washing machine which comes in a smart black finish. It only has a 6kg capacity but that’s fine for standard wash loads and it does come with a Daily Quick programme that can do a full load in just 28 minutes. Not so handy for those who won't be using the Daily Quick programme though, as the other programmes can take a while. Although, there is a time saver function, variable temperature and spin and quiet performance. Great value for money and good build quality, too. Shop more washing machines at Amazon. Looking for more laundry and washing advice?